Authorities should make sure every opinion is heard in a country as diverse as Russia, said President Dmitry Medvedev while addressing the State Council. The country’s top political leaders have discussed ways of improving the country’s political system. The Friday's summit, convened by the president, was the first of its kind. It was called for following criticism over recent state elections. “Our political system is far not ideal, but it works. 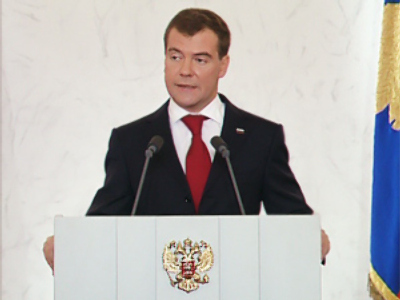 Heads of federal subjects [constituent units] and political leaders have done a lot to make Russian democracy efficient,” Medvedev said in his opening speech at the summit of the State Council. The politicians gathered to discuss the development of the country’s political system and democracy – an “unusual” topic for the State Council, the president said. It was the first time ever that this issue was discussed separately and at such a high level. “Therefore, the discussion will be serious and straight,” he said. Friday’s State Council meeting involved all the top executives, regional governors and leaders of all political parties, including those who are not represented in the Russian State Duma. 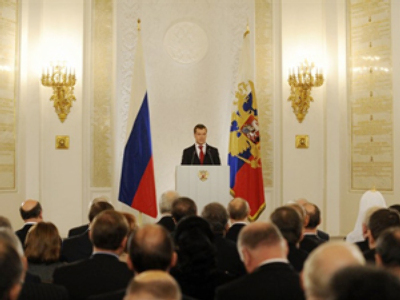 Most of those in attendance were from the opposition political parties, as opposed to the ruling United Russia Party. Back in his address to the state in November 2009, one of the issues he stressed as very important was making modern changes to the political system that had come under a great deal of criticism inside the country. 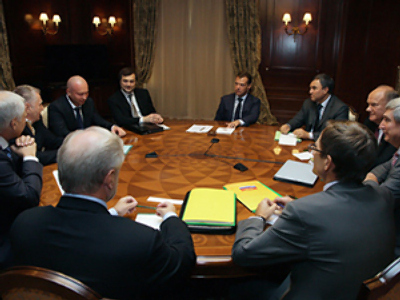 The first steps towards changes were announced at the State Council. Medvedev said he would submit a draft law on Friday that would allow parties that get over 5% of votes at regional elections to be given seats at regional parliaments. Currently the barrier for doing so is at 7%. 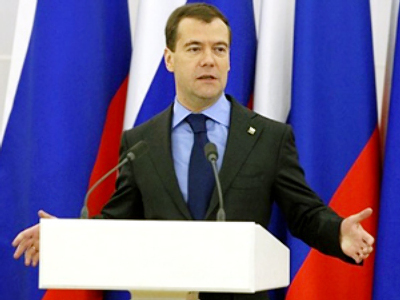 The number of political factions represented in regional parliaments is also very different, Medvedev said. There are parliaments with only one faction registered, whilst others provide seats for representatives of up to five. The president referred to Moscow City Duma as an example of a parliament with only two parties represented: the ruling United Russia and the Communists. “Does it really reflect Muscovites’ political preferences? 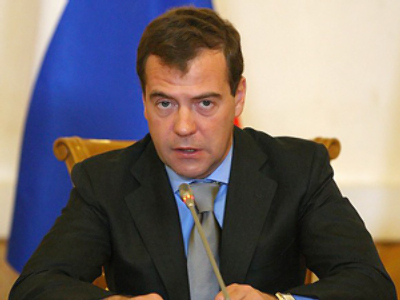 I very much doubt it,” Medvedev said. The reason behind that is low voter turnout, which is “a political problem” as well, the Russian head of state noted. He underlined that this is not being given any “prescriptions”. “It is up to voters to decide which parties should work in the parliament and which should not,” the president said. However, he went on, regional leaders should analyze whether parties representation reflects voters’ needs. 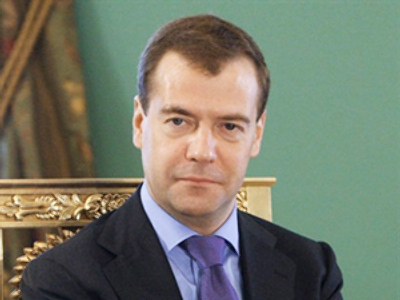 Medvedev stressed that Russian regional leaders should interact with all parties, even small ones. “There is not a single territory where all residents have identical political preferences,” he said. Prime Minister and leader of ruling party United Russia Vladimir Putin, who was sitting on the right hand side of the president, echoed Medvedev, saying that the country’s political system should be modernized. ”However, we should be cautious in order to avoid the ‘Ukrainization’ of Russia’s political life,” the premier said. “Totalitarianism and despotism” are not acceptable either. “Thinking of improvements… we should follow the principle common to every efficient political system,” Putin said. And that, according to the premier, is a fair bit of “conservatism”. “The political system should not tremble like a bowl of jelly every time it is touched,” Putin stated. In October 2009 there was a mass walkout of MPs from the Russian State Duma as a protest against the results of the regional elections which they said had been rigged. 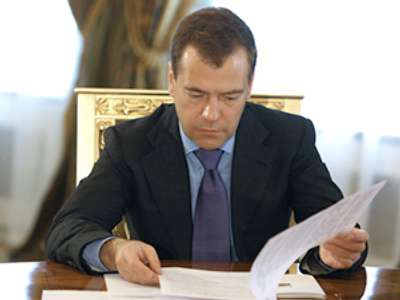 Many deputies called on President Medvedev to hold a meeting to discuss this issue. Friday’s assembly, which Medvedev proposed in his November address, hoped to tackle that very dilemma.The party leaders suggested their ideas for reforming the political system. “It's time to realize that manipulation doesn't work in the financial crisis. The voters don't want to be deceived,” said Sergey Mironov, speaker of the Federation Council, the upper house of the Russian government, and leader of the Fair Russia party. “Only real competition between the political parties representing the interests of all the citizens can lead the country out of the crisis. And most importantly, if there is competition, all the protests will exist within the framework of the political system,” he believes. The leader of the Communists, Gennady Zyuganov, has called for an open dialogue and warned against mistakes made in the past. “The council should realize that the Soviet communist party was even more powerful than United Russia is today,” he noted. “The Communists failed as there was no real dialogue, and a single man’s order was mindlessly carried out. We can't repeat the mistakes which led to the loss of over half of the territory and a vast amount of personal wealth,” Zyuganov said. The leader of the Liberal Democrat Party of Russia, Vladimir Zhirinovsky, believes new blood should be injected into politics. As for ways to realize the idea, the politician proposed to limit the time authorities of any level of power can occupy a ruling post to ten years. In other countries, he said, the opposition decides whether the election was fair. “If the opposition says: Yes, it was fair – then it was fair,” the LDPR leader said. "Modernization means stronger opposition, but not weaker United Russia"
“The modernization of the political system is an important element of the modernization of the country as a whole,” said Dmitry Polikanov, advisor to the head of the central executive committee of the United Russia party. “I think Medvedev’s idea is that there can be no perfect system, but we should not undertake revolutionary measures to change the system which is sustainable and has proved its efficiency, for instance, in combating the consequences of the economic crisis,” he told RT. The president has proposed a draft law which will guarantee seats in local parliaments for all parties which pass the 5% threshold. That is a very important step, according to Polikanov, since even if we speak about interests of three or five percent of voters, “We must remember that Russia’s population is huge, so 5% is five million people.” And their opinion should also be taken into account," he added. Polikanov believes that, despite the criticism voiced by some people, the steps taken by the country’s leadership indicate there is progress. “If [the opposition] do not have bright and popular leaders, if they do not suggest programs which could become popular among the public, they cannot blame stronger parties for their failure in the elections,” Polikanov stated. “I think that the idea of the modernization of the political system is not that United Russia should become weaker, but that the opposition parties should become stronger,” he said. “The idea of this State Council which, for the first time, is focused on Russia’s political system is not very clear to me, because this political system needs to be improved and it needs to be improved fundamentally,” said Nikolai Petrov, an analyst with the Carnegie Moscow Center. Petrov believes that participation in Russia is extremely low due to the pre-selection of political forces, even registered political parties and those who are not desirable either for the Kremlin or for the regional authorities. “They don’t have any chance to participate in elections, so the problem with the electoral system is fundamental and it needs to be totally reshaped”, he added. The State Council, a supreme advisory body, is chaired by the President of Russia and one of his aides – currently Aleksandr Abramov – is its secretary. The Council is made up of the leaders of all the 83 constitutional units (or federal subjects) of Russia. The State Council Presidium (or Panel), which organizes the council’s sessions, is usually comprised of the leaders of seven constituent units representing each of the seven Federal Districts. However, following the recent establishment of an eighth district – the North Caucasus – the number of members might be changed. The panel normally meets once a month and its members rotate every half a year. On the eve of the council’s sessions the panel gathers to work out the agenda for the following day. The State Council holds meetings four times a year and considers a wide range of issues such as economic and social reforms, education, security, development of the state’s political system and the country as a whole. Each session focuses on one particular topic. The body has a long history in Russian history and this year it marks a double anniversary. It is 200 years since Tsar Alexander the First established the State Council with a manifesto published on January 1, 1810. It replaced a similar institution established by Alexander the First in 1801 which was called the Permanent Council and existed in one form or another until the revolution in February 1917, when it was abolished. An attempt to revive the body was taken in 1991 by the first and only president of the USSR Mikhail Gorbachev. However, the second State Council in Russian history ceased to exist several months after it was created with the dissolution of the Soviet Union. In addition, the current State Council celebrates its 10th birthday this year. It was established by then-President Vladimir Putin on September 1, 2000, and held its first session on November 22.